Located very close to Lake Superior and near the Duluth Rose Garden, Valentini’s Vicino Lago features Italian Cuisine at affordable prices and offers a perfect location. You may choose to dine inside or outside on the porch enjoying the breezes of the big lake. 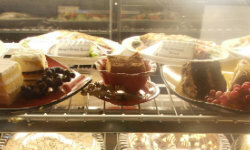 On Wednesday evenings, there is live music, half price bottles of wine, pasta specials and luscious desserts from 6-8 p.m. They will pack a light lunch for your stroll through the Rose Garden upon request. Three generations of Italians share their heritage and prepare delicious breakfast, lunch and dinner that will delight you! From the Author: For lunch we recommend the Reuben Sandwich and Tacchino Chicken Wrap which come with yummy kettle chips. Valentini's is a great place for a private party and Sundays are reserved for private events only. All desserts are $3.99 on Sundays!